The first thing we did, actually, before shopping was get to Orlando for packet pickup. 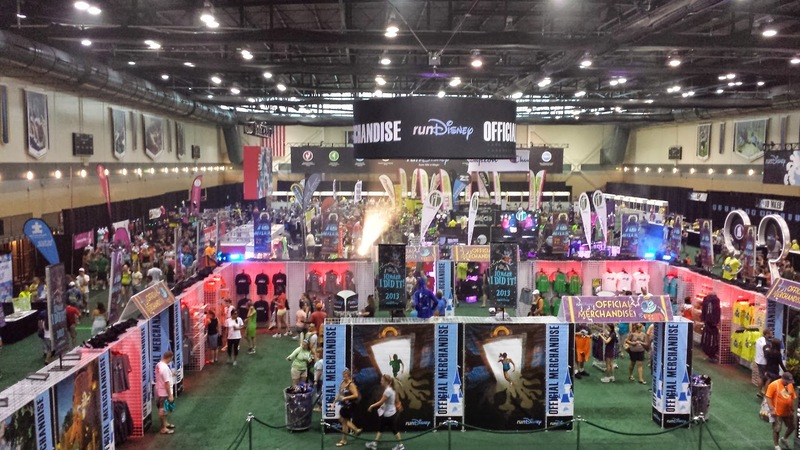 I love the fitness expos at races, especially big ones like Disney. There is usually a ton of interesting swag to buy and they also have other races in the area advertising there. I didn’t really see many other races at this particular expo but I might have just missed them. Since Champion is the official gear of the ESPN Wide World of Sports, that means the free race shirt is also Champion. As far as tech shirts go, they’re actually very comfortable. I wore my Wine & Dine shirt for 2 years until it was worn out. It was one of my favorites. Since I just tossed that one out recently, this shirt was a great replacement. Its a nice blue and features Stitch from the movie “Lilo & Stitch” as well as the Tower of Terror. Melanie’s shirt was too large for her and since the shirts were cut way too big, I ended up with two of them. 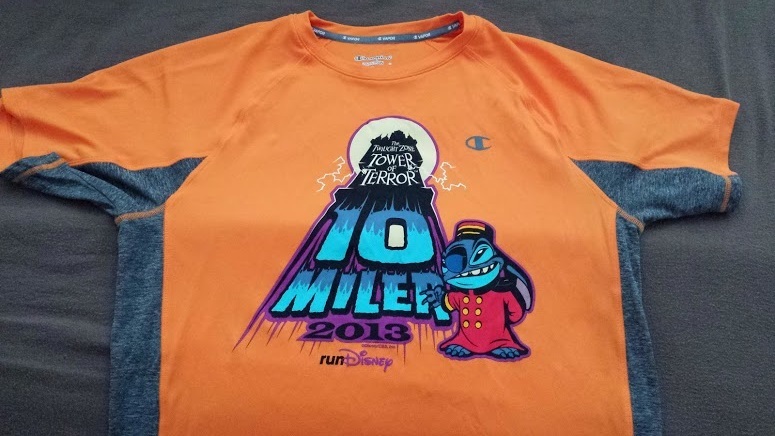 Two shirts almost makes up for the ridiculous entry fees for Disney races. 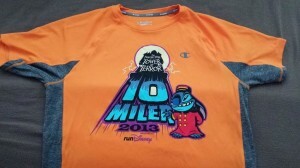 Of course, since I love Disney things, I had to buy another shirt that is the orange one I actually wore in the race. I also purchased a new number holder since I couldn’t find mine before I left the house and really, how could I not want a runDisney number belt? So much for saving money by getting an extra shirt free. Since this race was at night, it did present some interesting issues for all of us. We met with Evan at the Rainforest Cafe in Downtown Disney which ended up being perfect, I think. I haven’t been an evening runner for a year now and fueling up for a late night race just isn’t the easiest thing in the world. I wanted to eat light and got a chicken & pasta dish. I think the dish itself was about right though I’m pretty sure I should have had about half of what I ate. After that it was off to the starting area to stand around and wait. I’ve mentioned it before but the one downside to a Disney race is you have to get to the race significantly before the race starts. The busses only run from 7-8 and the race starts at 10. We had to be in our corrals by 9:30 but since we got to the race around 7:30, we had about 2 hours to kill. We took some pictures, hung out, and I danced to some song that I no longer remember at the moment and should probably be forgotten by anyone who witnessed it. I’ll stick to running & tris! We managed to miss the announcement to get to our corrals and when I looked over, I saw that C corral was gone! Oh no! So I got a quick warm up run while I ran to catch up to them. Unfortunately we all couldn’t start together. Melanie could have but they wouldn’t change her starting time. Disney is quite strict about what they accept for a time change which is annoying since I didn’t exactly need to present a notarized document for my original starting time. The next couple of hours were just me and my thoughts. For 30 minutes before the race I just spent it trying not to think about my race. 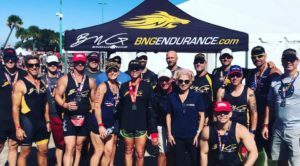 I had a disappointing result in my January marathon (I loved the experience, don’t get me wrong, but I know I can blow that time away) and I want to see what I have in me for my Space Coast Marathon. I’ve had some good training runs but this race was my first personal test to see where I’m really at. I was a little nervous because, like every race this year it seems, it was quite warm. Fortunately it only got cooler as the race went on but it started in the mid-70s and dropped only to the low-70s. Basically about 15 – 20 degrees warmer than I would want and about 10 degrees warmer than I expected which makes me either an optimist or delusional. The start of a Disney race is always awesome. Music! Lasers! Fireworks! 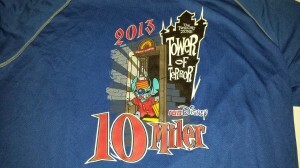 This was the Twilight Zone Tower of Terror Ten-Miler so we kicked off with the Twilight Zone theme and fireworks. Every wave gets the same treatment which I think is awesome. The race fee is expensive but at least they don’t cut corners. There’s definitely a pretty warm feeling when those fireworks go off and you start running. And away went went! Usually I’m a pretty friendly runner during a race but I had a plan in my head and my only thought was to dig in and go. No chatting from me (probably to the relief of everyone around me). I decided that I was going to do my first 3 miles at a 9:15 pace, bump it up to about 9:10 for the next 3 and then for the final 4 miles, just push as hard as I could. It sorta went like that. Except my first 3 miles I was doing about a 9:05 pace. I knew I was running a bit faster than I planned but I honestly felt great and just didn’t want to pull back at all. The course itself was standard Disney. Big signs at the mile markers and tons of character stops. 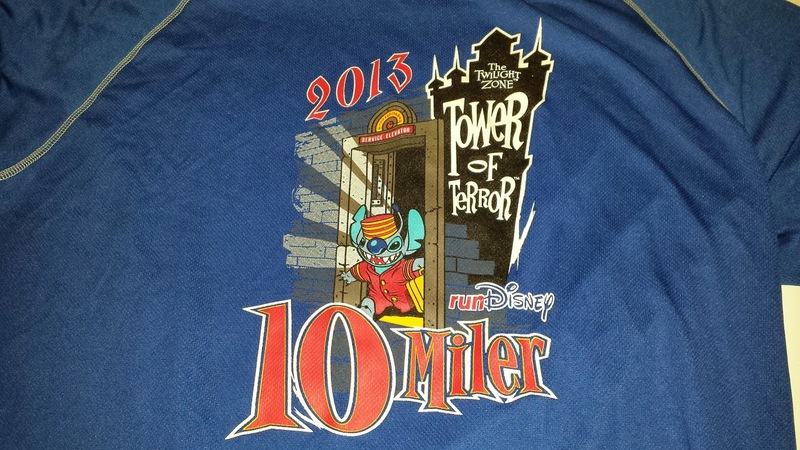 This race is all villains so I can’t remember everyone in the first 3 miles, but I recall Captain Hook at least. Unfortunately, as this is a shorter race, once we got to the Wild Animal Kingdom, we turned around and kept to the road. The WAK is a great park to run through but the course couldn’t get us through there. Right after the turn around was the 5k mark so that was where I kicked it up a bit. I was already running faster than planned so of course that meant I was even faster than before. I averaged about an 8:52 pace for the next 5k of the race which I am quite happy about by itself. Around mile 4.5 or so there was a turn into a dark forest path. This was pretty cool since the ambiance was great. The broken lighting halfway through wasn’t as cool since it was a forest trail and not great footing but obviously I survived. I recall seeing a hyena from Lion King somewhere around there before I got into the ESPN Wide World of Sports. ESPN isn’t the most exciting place to run but its definitely the most comfortable! There’s an awesome track we get to run on and then around one of the baseball fields. It definitely beats the pounding of the pavement so its a nice respite. The baseball field actually had people in the stands too so that was a nice boost. When you leave ESPN though, that’s when you hit mile 7. Mile 7 was Mile 20 on the marathon so I had some bad memories for a moment! The race also got a bit harder for me here. I think this turn brought us into a bit of a headwind and the heat was starting to get to me. The next 3 miles of the race were just not as strong as where I’d been. By mile 7, my average pace read 8:58 which was pretty exciting to me. Alas, it wasn’t meant to be! Those next three miles I averaged about 9:17. I wasn’t really passing many people at this point though I only got passed by a couple. I wasn’t going down without a fight though! I knew I wasn’t going to get under a 9 minute pace for the race but I wanted to push it out until the end. I don’t really remember many characters at this point but the last mile and a half was through Hollywood Studios which means getting to run down fake NYC and through the backlot as well as through one of the stages for one of their outdoor stunt shows. There were a few more things we ran though but I wasn’t entirely aware of them at this point! I managed to get that last mile under a 9 minute pace and I finished the whole race in 1:31:21 which ended up a 9:08 pace for the whole thing. I came in 80th in my division (out of 563) which, for me, is a great accomplishment. I had this idea half-way in that maybe I’d break the 1:30 mark but I’m very happy with this time. This would have me just under a 2 hour half marathon which is a goal I have next and bodes very well for my marathon coming up. So what were the 3 of 4 things I accomplished? 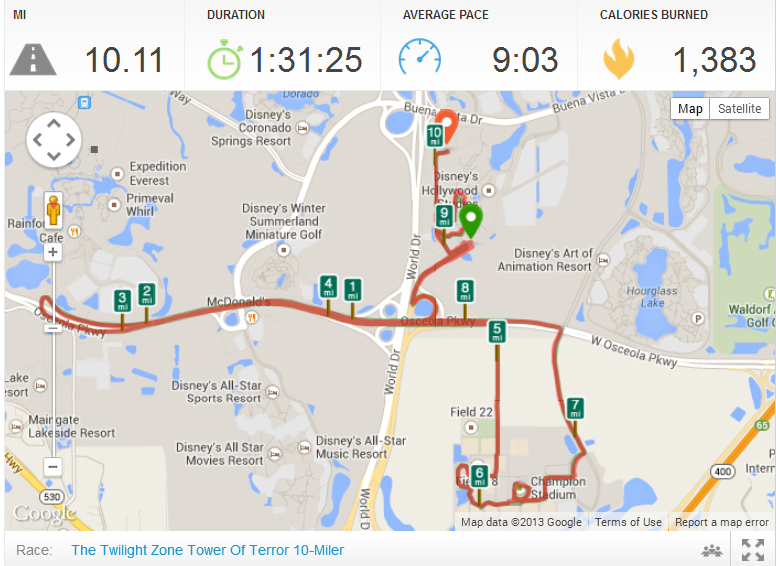 The only thing I failed on was that I wanted miles 7 – 10 to be even faster than 4 – 6. 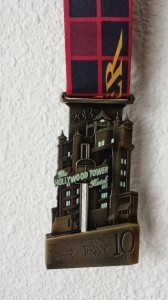 Oh, and the medal that they gave us was as cool as any other Disney medal. It is the Tower of Terror with an elevator that moves. 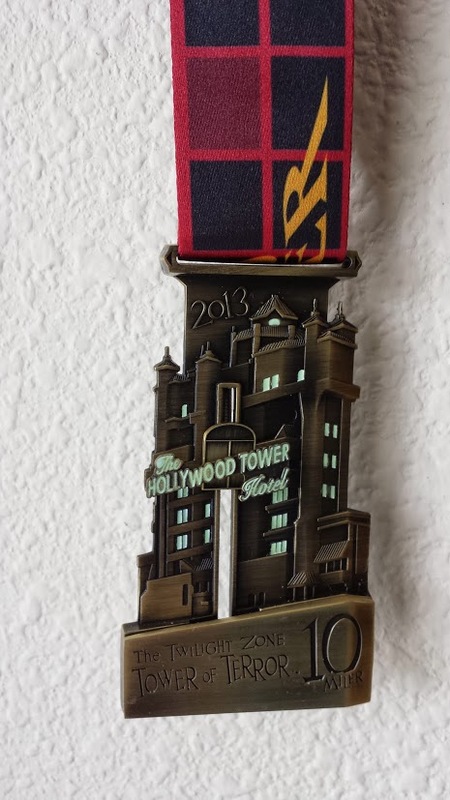 There’s a bunch of glowing paint on it so the medal also glows in the dark. I think if I do another Disney race it will have to be Wine & Dine. Best course & start time for a race.